Enjoy a farm experience with fresh organic produce (in season), and pastured eggs from happy chickens and ducks. Our quiet, peaceful property is minutes away from Highway 1 to Powell River. Leave the playpen at home; we have a nursery, playroom, and country kitchen/living space in the private suite. Your hosts, Ginny, Jessie, and Eric, will be out and about on the farm, available to answer any questions you may have. 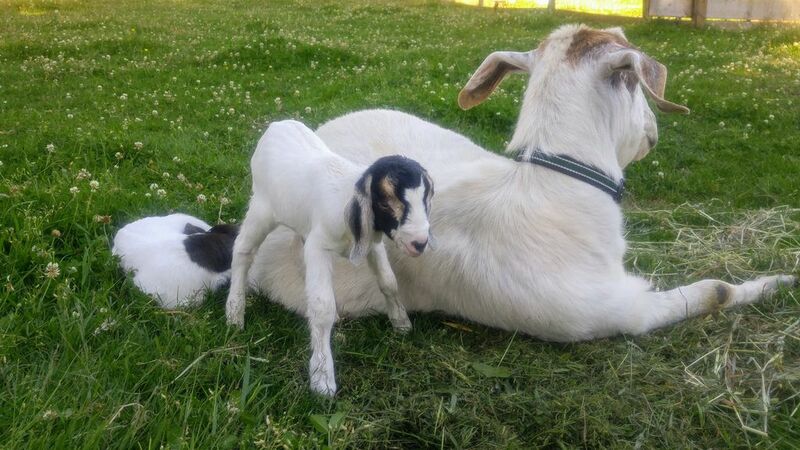 Guests are permitted (only in the presence of one of the hosts) to interact with the animals, collect eggs, and even try their hand at milking the goats! It has always been Eric and Jessie's dream to have a hobby farm. He wanted to raise animals and make cheese, and she wanted to make use of her horticultural training. While raising ten kids, they purchased a parcel of land south of Powell River in 2004 and designed and built their "Green Gambrels" house. Now that the kids are all grown they'd like to share the family farm experience with other families and guests. ​ Their daughter, Ginny, and her husband, Nat, moved to the farm to help with the bed and breakfast, and to care for the animals and grounds. There are nearby beaches, fishing, canoeing routes, craft markets, and local festivals. Powell River has live music venues, great restaurants, and even a famous craft brewery situated in historical Townsite. There are many farm animals to interact with, a playhouse, gazebo, pond, playroom, nursery, and other family-orientated spaces to enjoy. We are about 6 minutes' drive to the beautifully sandy Mahood Beach. We are located on a 5 acre farm in a quiet forested neighborhood of mostly hobby farms and private 5 acre lots. ask us for access to a landline. Local calls are free, long distance charges vary. small dumbbells and exercise ball available. TV with Chromecast, Netflix, DVD player etc available. Plenty of board games to play. Two big comfy couches that can also serve as bedding if needed. Spices, condiments, and some rudimentary supplies in cupboards. Please let us know if you need more ingredients as we also have our own to provide if needed. Full kitchen available, including fridge, stove, dishwasher, sink, big dining table, microwave, lots of counter space, coffee maker, toaster, cutlery, etc. Chromecast, Netflix, DVD player etc available. We are located in a forested community near the ocean. Hiking, swimming, and beachcombing are some of the most common activities in our area. In addition, there will be plenty of opportunity to spend time with our farm animals and enjoy the farming lifestyle right outside your door!